In Amsterdam South, a newly renovated office building with a shimmering silver roof has achieved BREEAM Outstanding, a green building rating that arguably makes the property the most sustainable adaptive reuse project in the Netherlands. Formerly a neglected office complex, the empty building was transformed in the hands of Dutch architectural firm Benthem Crouwel Architects and now serves as the energy-positive offices for Goede Doelen Loterijen (Dutch Charity Lotteries). A major goal of the new Goede Doelen Loterijen office was to gather the company’s approximately 600 employees — who had been distributed at different branches for years — into a single location. 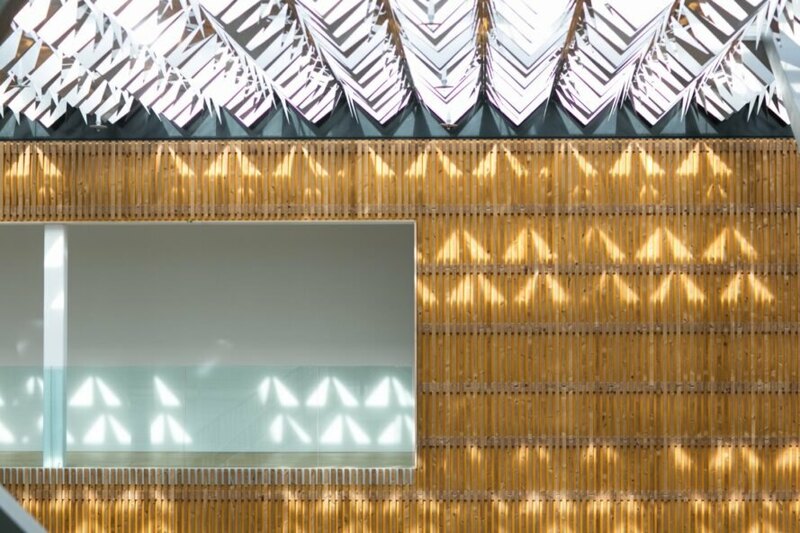 Because sustainability is a core value of Goede Doelen Loterijen, the new office also needed to be highly sustainable and render the company’s social ambitions visible. Therefore, the building design emphasizes accessibility and transparency, communicating the message that it serves both the employees and the neighborhood. In addition to offices, the building includes a public restaurant, an auditorium and a TV studio. Nearly 7,000 leaves made of polished aluminum cover the roof, supported with slender, tree-shaped columns. The new forest-inspired roof shimmers and changes appearance depending on the time of day and is easily recognizable and visible from afar. In addition to the glittering silver leaves, the roof is also integrated with 949 solar panels and a rainwater collection system for green roof irrigation. Materials from the former office complex were reused, while all new materials have been selected for their sustainable and recyclable qualities. Benthem Crouwel Architects designed this adaptive reuse project for Goede Doelen Loterijen. The architects implemented several modern, green design elements into the old office building. Now, a shimmering roof draws attention while also serving as a home for greenery and solar panels. The project has earned BREEAM Outstanding. 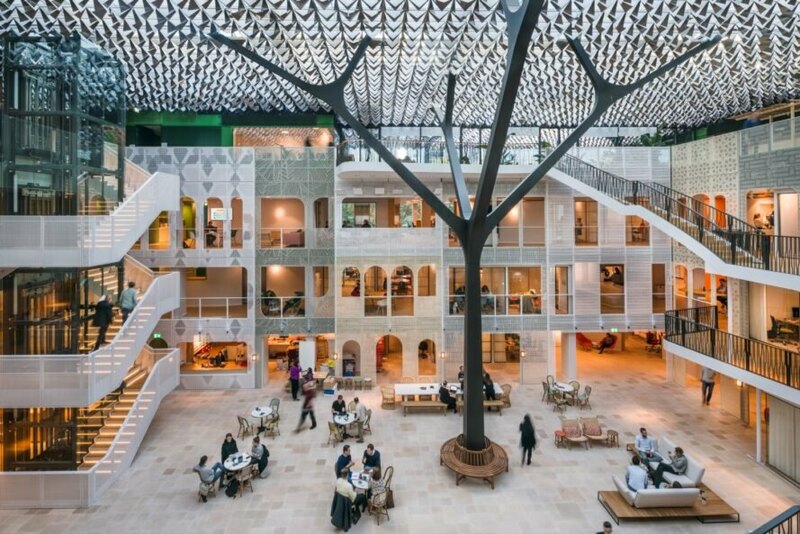 The building is now one of the most sustainable renovations in the Netherlands. The structure holds offices, a public restaurant, an auditorium and a TV studio. The office hosts about 600 employees. The design is inspired by forests. The project utilized materials from the old building as well as new materials selected specifically for their sustainable qualities.